Pay attention wine lovers! 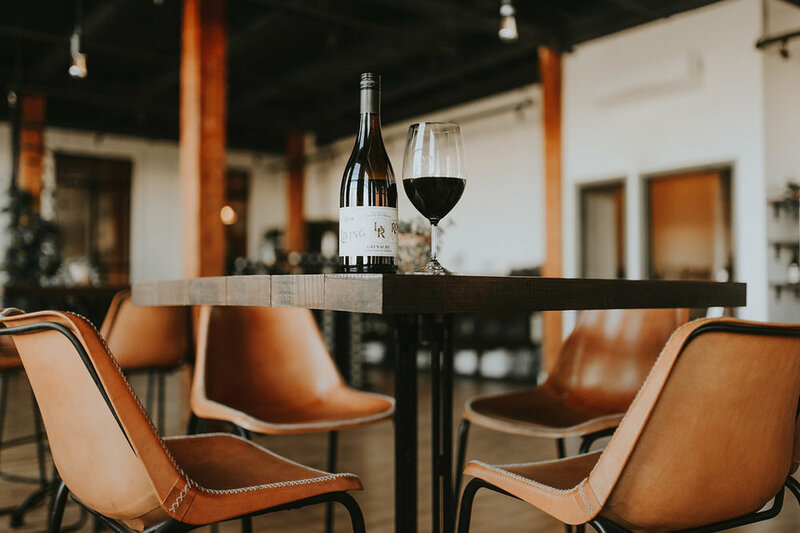 Help us welcome the newest kids on the block to Rochester's food and drink scene, Living Roots Wine & Co. Owners Colleen and Sebastian Hardy are opening the city's first urban winery and it does not disappoint. They have put an incredible amount of thought, time and effort to bring together the best of their hometowns (Rochester and Adelaide, South Australia) and are serving it all up in a cool and eclectic space on 1255 University Ave. We sat down with Rochester native Colleen and asked her ten questions about our new favorite hangout. Take a look. After graduating from Mercy High School, I went to Michigan State to study Marketing. I went on to work as a marketing research analyst for big food manufacturers in Chicago. It was a great job out of college and I learned so much in my time there, but it wasn’t something I could see myself doing long-term. So after a couple years in that role, I was ready to find a job outside of the cubicle, and ideally in an industry that interested me more than processed food. I took an online course on wine and wine making and loved it. I would look forward to watching the lectures after work, and I was picking up other wine books on the side to learn more. I figured that in order to properly market wine, I should probably learn more about how it’s made, and so I decided to find some harvest work. One thing lead to another, and suddenly I was quitting my job and heading to Adelaide (South Australia) to work as a cellar hand at Hardy’s Tintara (a winery founded by Sebastian's great-great-great-grandfather). How did you and Sebastian meet? He was a mutual friend of several other vintage cellar hands at Tintara. My friend told me she thought we'd be a perfect match, but I figured I’d never actually meet this guy. Of course, two days later, I met him at the grocery store and we immediately hit it off. What is Sebastian's background in? Sebastian's background is mainly in winemaking, having grown up around vineyards and wine his whole life, going on to get his degree in Viticulture and Enology, and working in wineries around the world. 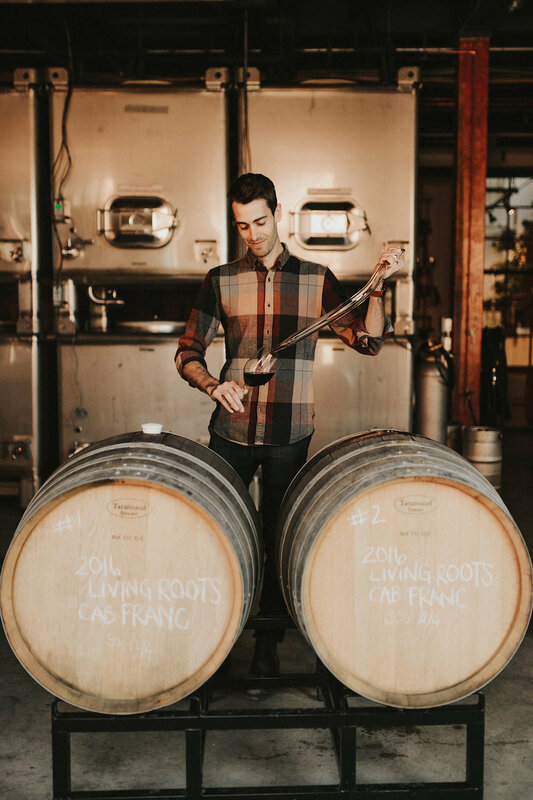 He’s also worked in tasting rooms and as Sales & Marketing Manager for one of his dad’s wine labels for a while. What is it like starting a business and working so closely with your spouse? We have really complimentary experiences and skill sets and we work incredibly well together. We bounce ideas off each other on all aspects of the business and luckily have very similar taste in design, wine styles, etc. We’ve been working nonstop since the idea of Living Roots came about, but it doesn’t always feel like work when we’re doing it together. 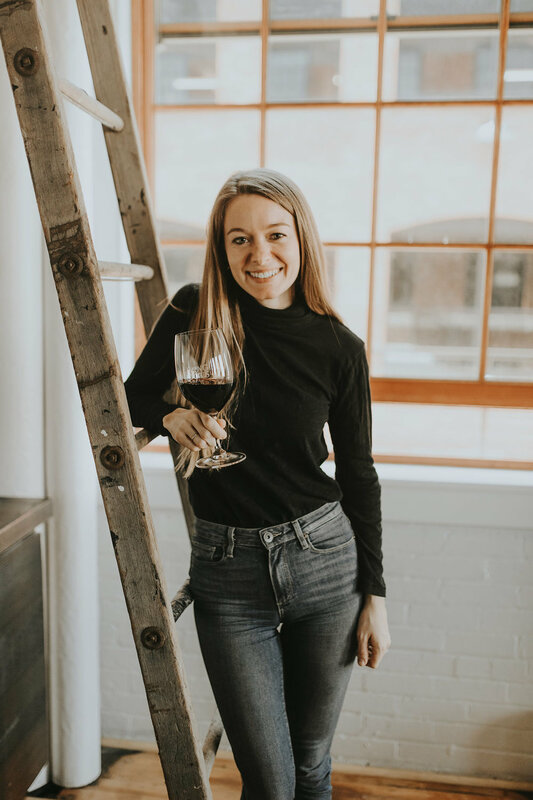 How did you decide to open an urban winery in Rochester? Sebastian was itching to get back into winemaking after doing a stint in sales and marketing for his family. He was always keen on making his own wine and was particularly drawn to the idea of an urban winery. We liked to think about doing our own thing one day, but we definitely didn’t think it would come together as quickly or on the scale that it has. Sebastian left his family’s business and started making his own wine at the winery where I was working at the time. After having a lot of fun working on those together, the idea of Living Roots started to evolve. I loved living in South Australia and I always look forward to getting back there, but it is truly on the opposite side of the planet from Rochester and I wanted to be able to spend more time at home. 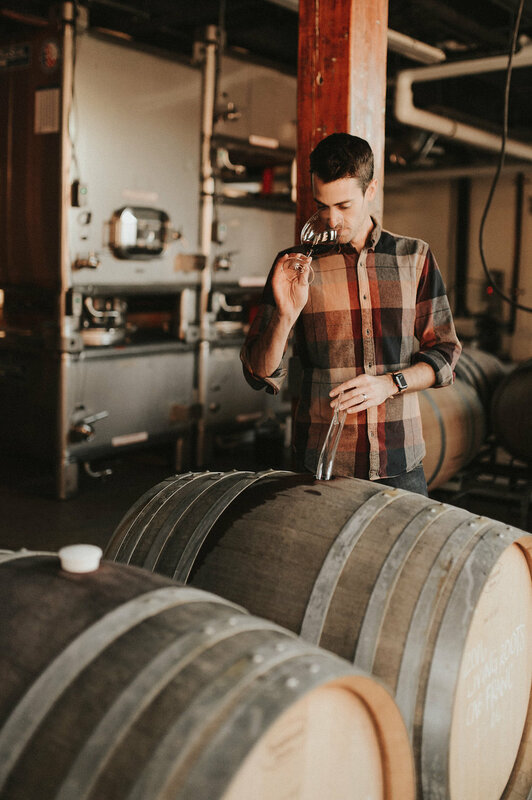 It also helped that Sebastian was really keen on cool climate wines and was impressed by the Finger Lakes when we came back to visit, so the idea of making wine in both hemispheres, and both of our home towns, started developing. 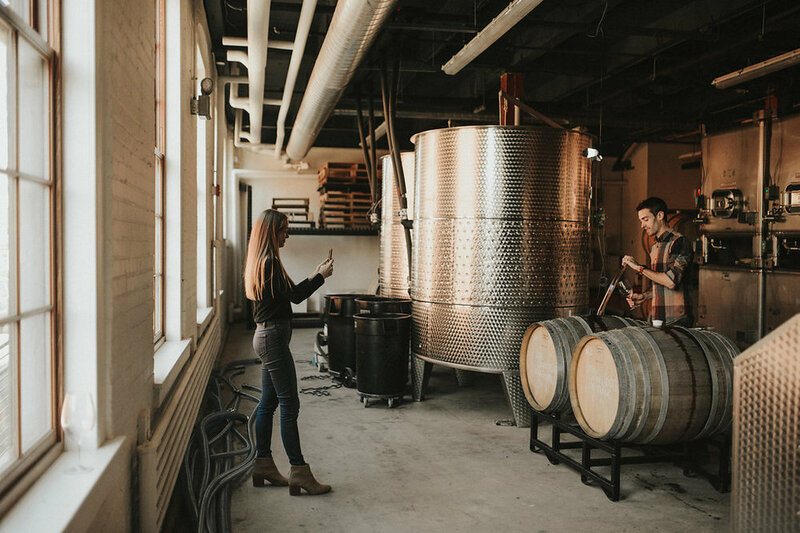 We saw a lot of potential for an urban winery in Rochester, with the craft beverage scene taking off and most of the wineries in the region being an hour’s drive away. What are your positions at Living Roots? I purposefully left positions off our business cards, because no title would capture it all. Every day is completely different and the number of hats we wear is countless, but that’s what keeps it exciting. If we were to simplify it and focus on a particular area, Seb is our head winemaker and I handle general business and marketing…. but setting up and running a small business across two countries have spread us across many more areas than just those and we work on a lot of it together. Tell us more about your amazing location on University Avenue. Referred to as the ‘G.W. Todd-Wilmot Castle Company Building’, our new home at 1255 University Avenue has seen many lives over the last hundred years. The original building was constructed in 1909, including where our winery and tasting room now are. Then there were several additions made, including the area where the Vault (aka private tasting room) is, which was built in the 1930's. 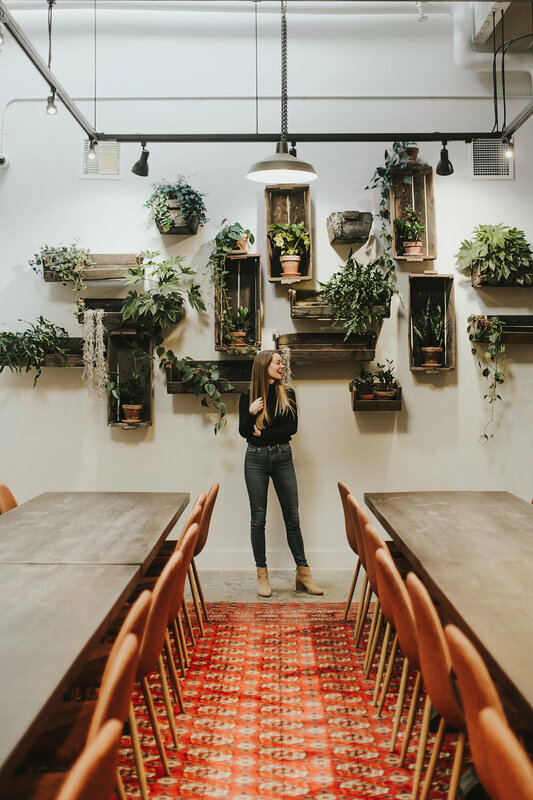 We’ve been told that since then, our space has held a variety of businesses, including a jeweler, a graphic designer, and a cosmetics company. When we found the space, you could see the potential, but much of the character of the building was masked by dropped ceilings, drywall, and paint. We were so excited to strip it back to reveal some beautiful historic elements such as wooden beams and ceilings, brick walls, an original fire bell and a couple of old vaults. 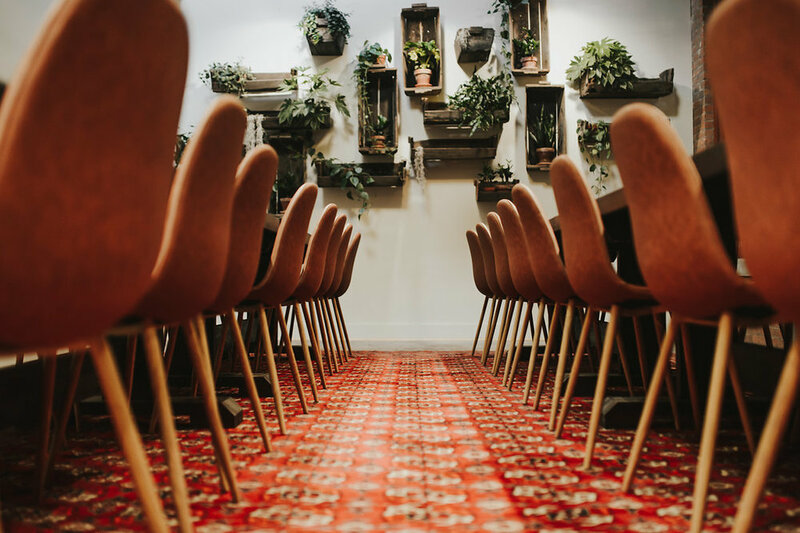 We’ve been working with our landlord over the last year and a half to make that happen, and we love how the space has transformed. Tell us all about your amazing wines. We have our New York State wines, now made on site in Rochester, while we also have our South Australian wines, that we produce, bottle and import ourselves. This certainly has its complexity with making wine in two countries, but it allows us to make a wide range of styles. 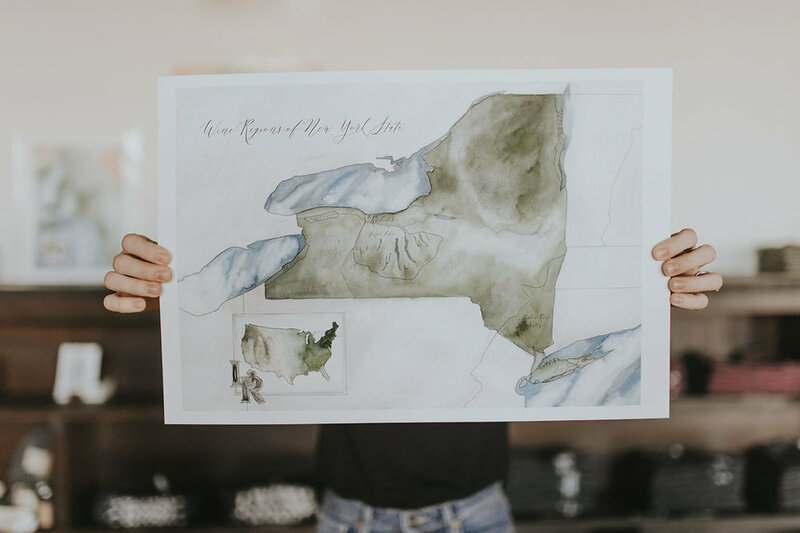 We source most of the grapes for our New York State wines from the Finger Lakes, but we’ve also taken parcels of fruit from Long Island and Lake Ontario. In the future, we’ll source grapes from my dad’s vineyard on Keuka Lake, once the new vinifera vines are producing. 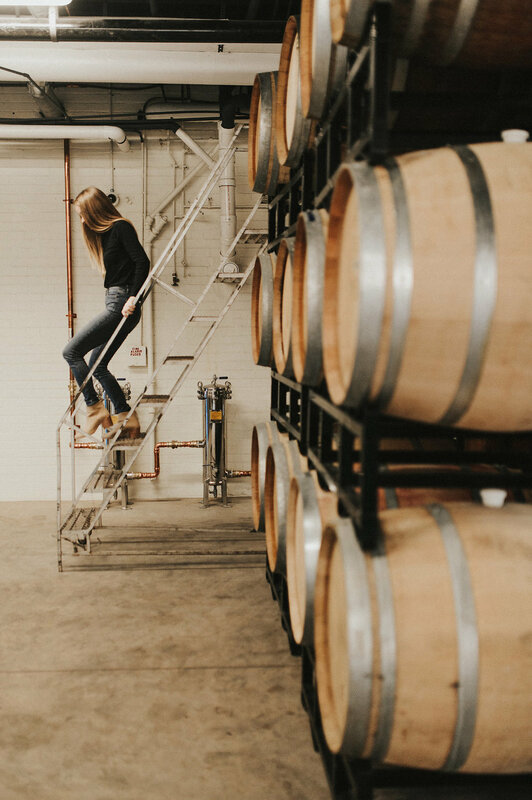 We’re primarily making still whites here in Rochester, though we’re also making sparkling wine, rosé, and a red, some of which are yet to be released. 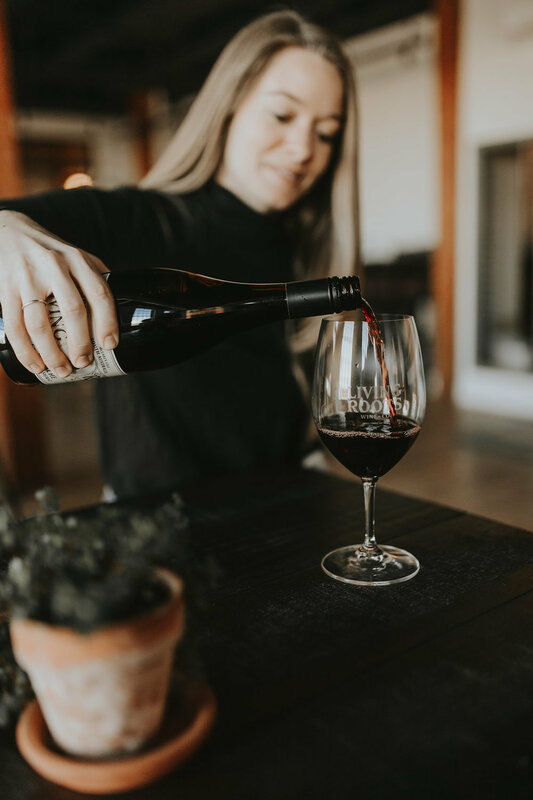 In South Australia, we’re sourcing grapes from a variety of vineyards across the warmer region of McLaren Vale and the cooler Adelaide Hills, with many of the grapes coming from Seb’s family’s vineyards. We’ll mainly focus on reds from these areas, but we’ve made a few whites from the Adelaide Hills including a Riesling and Chardonnay in 2016 and a Sauvignon Blanc in 2017. 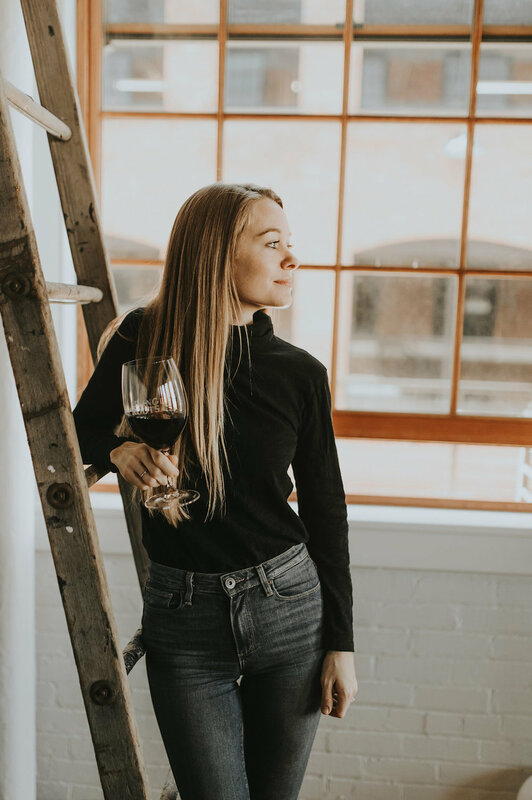 There will certainly be some continuity in the wines that we’ll be making each year, but there will also be a progression in wine styles and varieties that we produce. This is one of the benefits to not having our own vineyard, being able to change things up a bit year to year. What should we order when we come? We’re currently offering a couple of tasting flights – one that features our white wines from New York State and one that features our red wines from South Australia. This is a great way to get a sense for our range, or you can order a glass of any of our wines. We also have a retail area in our tasting room with wine by the bottle to enjoy at home, as well as merchandise and food. What do you love about Rochester? After living away from Rochester for 10 years, I feel like I’m becoming re-acquainted with the city in the best way possible. I’m constantly hearing of new bars, restaurants, producers, artists and other local businesses to check out. I’m so proud to call Rochester my home, and it means a lot to me that we can introduce something new to the city. Another thing that’s really struck me since moving back to Rochester is the tight knit and welcoming community here. We’ve loved collaborating with other Rochester small businesses and hope to do a lot more of that in the future. Louelle Design Studio made some beautiful custom maps for us, featuring the different wine regions we’re sourcing grapes from. Tiny Fish Printing printed a bunch of our apparel and Hannah Betts from Lives Styled installed a gorgeous plant wall in the Vault using old grape picking bins. 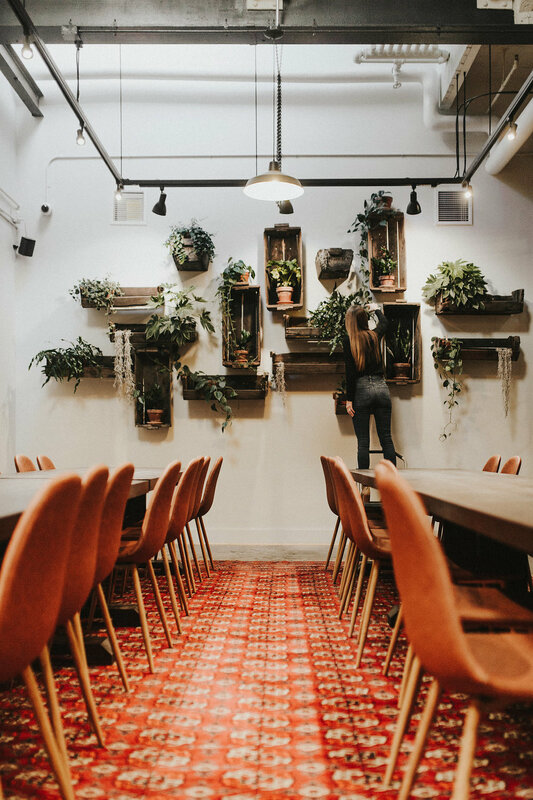 Even within our building, carpenter Carter Rich built most of our furniture including the bar, Tracy from MeNu A Design Studio created interior signage throughout our space and Park Avenue Picture Framing framed old photos and artwork for us. There are loads of other potential collaborations and we’re really looking forward to exploring those.